Abstract: In 2005, New Orleans, Louisiana experienced an interruption in its neighborhood life cycle due to Hurricane Katrina. While federal, state and local administrative policies have tried to manage the process of recovery, the non-profit sector has been a key to the recovery. This paper will examine the case study of the Beacon of Hope Resource Centre (BOH) whose ability to collect data, expand citizen engagement and influence policy made a positive impact upon economic development through public participation geographic information systems (PPGIS) with the Regional Planning Commission and the Department of Planning and Urban Studies, University of New Orleans. This successful neighbourhood planning model provides an understanding of how PPGIS partnerships can support and encourage community engagement and economic development pre- and post-disaster. geographic information systems; GIS; hurricane Katrina; public participatory GIS; community planning; New Orleans. 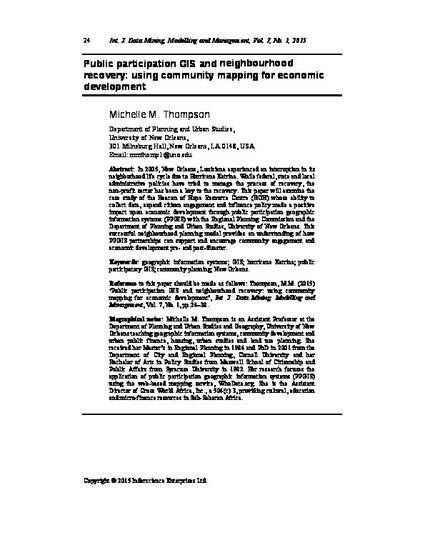 Public Participation GIS and Neighborhood Recovery: Using Community Mapping for Economic Development.” International Journal of Data Mining, Modeling and Management. Citation: V7 N1 2015 (Journal publication, 2015).